I can hear it now – “This isn’t scrapbooking!” – and you are right – it isn’t. 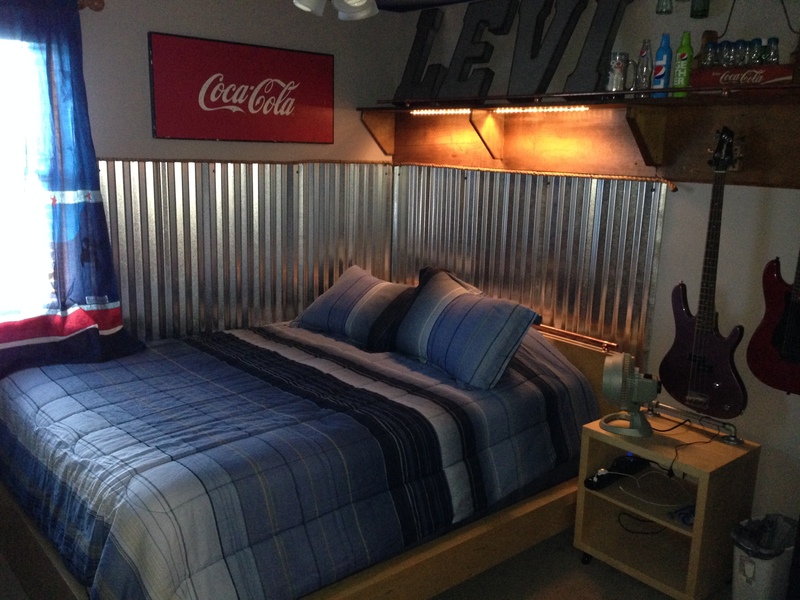 But it is my blog and I have spent the last week working on transforming my son’s room and I wanted to show it off. And I need somewhere to put the pictures that I want to put on Pinterest! This all started when my son put some holes in the wall near his bed in the middle of a dream. I realized that I needed to put up some kind of protective covering on the wall when repairing the holes, to keep this from happening again. Originally I thought that I would build an L-shaped headboard that was padded, but after showing my son all of my ideas he liked the idea of putting some kind of wainscoting on the wall instead. We debated between putting wood floor paneling on the wall or the corrugated steel that we eventually decided upon. Then the project grew from there – as we were emptying the room for painting I asked my son what he wanted to do with his bottle collection. I was hoping that he was ready to get rid of it – but he wasn’t – and he said – maybe we could just hang them on the wall – and that is what we did. Same shot as above, but with the lights on to get a different perspective on the room with more light. I ordered the corrugated steel in sheets from Lowes cut to the specific height/length that I needed so that I would not have to figure out how to cut it at home. I then drilled small holes through it and then used screws and rubber washers to fasten it the the wall. The rubber washers are important as they need to bend to fit the curved form of the corrugation. the hardest part of this project was cutting out the holes in the sheet metal for the electrical outlets to come through. I accomplished this by carefully measuring where the cuts needed to be made and then drilling holes in the four corners of the rectangle. I then used tin snips to cut out the opening. Once the corrugated steel sheets were on the wall I used an electrical outlet box extender to move the faceplate beyond the corrugated steel. 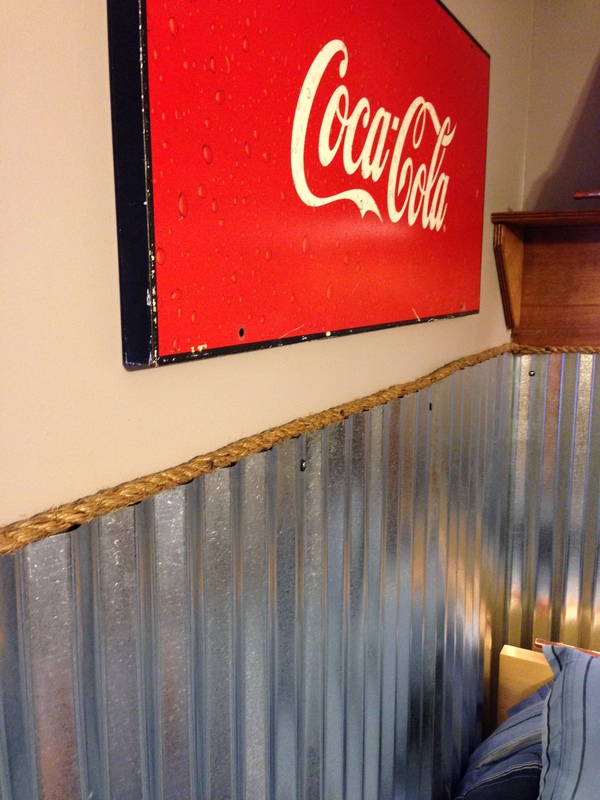 This next picture is a closeup of the corrugated steel wainscoting. Once it was on the wall I realized that the top of the steel was sharp and I felt like it might create a dangerous situation that someone could get cut on. I thought about putting wood trim across the top of it, but that would have been difficult to do where the shelf was, so I opted to use construction rope instead. I attached the rope to the wall by drilling drywall screws through it about ever foot or so, and it is holding it in pretty solidly. 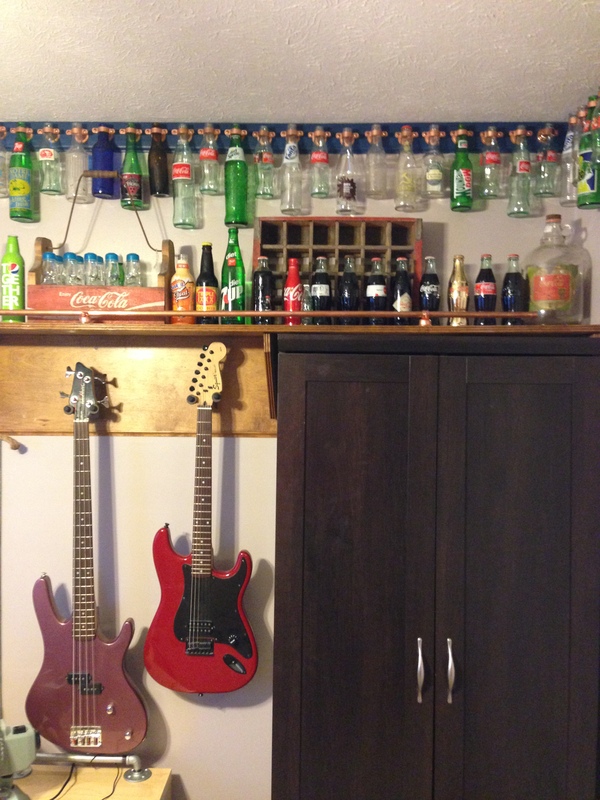 The picture to the left is of the bottle collection. Previously all of the bottles were just stacked on top of the built in shelf. 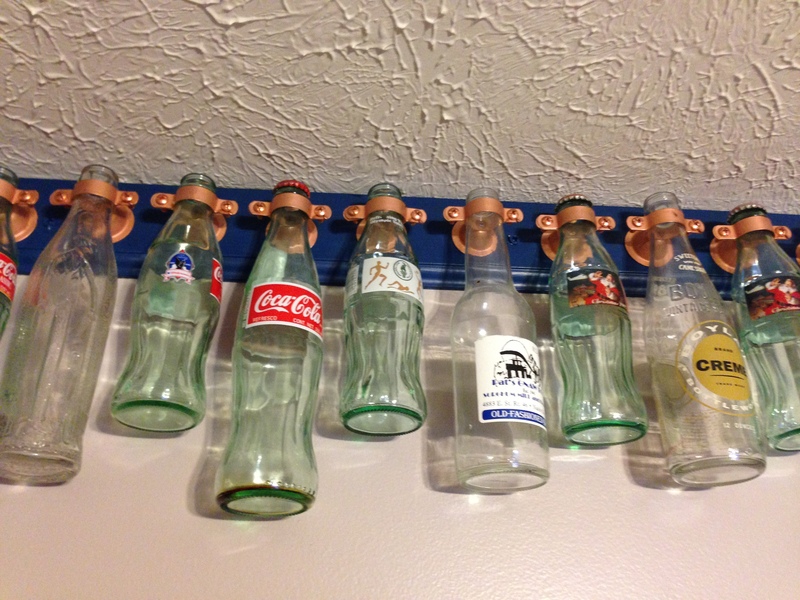 The collection is bottles that my son finds interesting, but consists mostly of Coke bottles. But now you can see that full bottles are still on the shelf, while empties are hanging from the ceiling border. I was worried that hanging full bottles would be too heavy and possibly cause the border to fall. The next picture to the right is a closeup of how the bottles are hung. I purchased wood trim and cut it to size and then painted it the dark blue. (My son chose all of the colors in the room by the way – with just a little help from me). My son helped me to hang the trim right up next to the ceiling and then I put a 2 inch wood screw through at every stud to make sure that it the trim could handle the weight of all of the bottles. 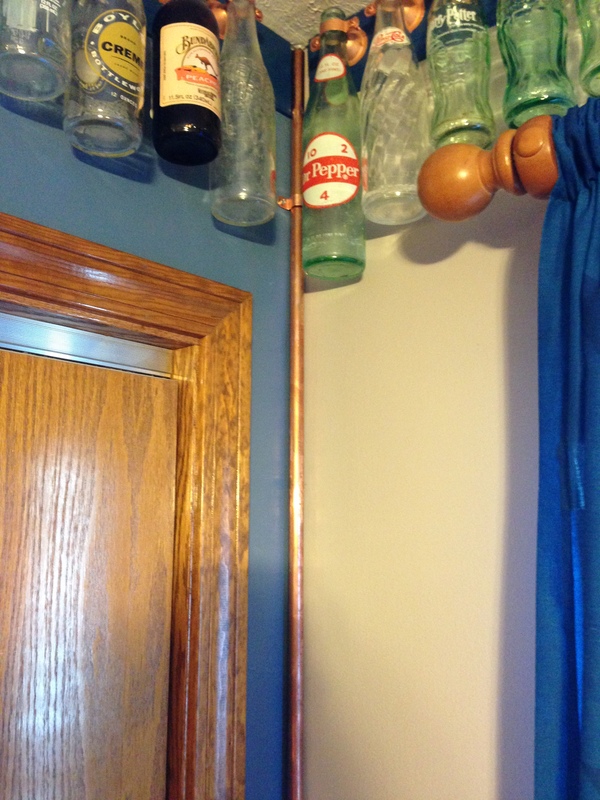 The bottles are hung by the neck with a 1 inch copper bell hanger – which are normally used to hang copper pipes in basements. These cost about $1.80 a piece, but I was fortunate to buy a bulk lot for about $0.45 each. Unfortunately I did not buy enough and when I went back to buy more they were out of stock – so – when I need more to finish the border and add to my son’s collection I am going to have to buy the more expensive ones at Lowe’s – unless of course someone can help me find them somewhere cheaper. So far we have about 80 bottles hanging on the wall and I think we only have about 40% of it done. I am not disappointed that we could not finish it all the way around, because now it will become a family adventure to collect more bottles on our adventures. 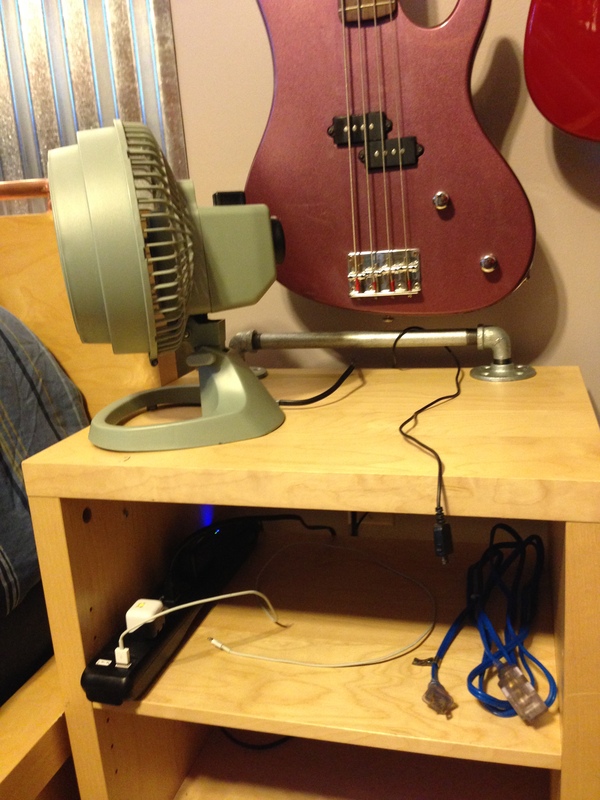 This picture shows the other corner of his room. I had to use short coke bottles above the curtain rod because it was so close to the ceiling. If you look closely you will see that I placed a copper pipe in the corner of the room. I did this to hide the uneven paint lines where the accent wall meets the other wall. I have never been able to get a perfect paint line in corners like this, so I opted to hid it with the copper pipe – which adds to the industrial feel of the room. You can see in the picture to the right a closer view of this, and can also see the copper bracket that I used to attach it to the wall. I had to bend the bracket from a 180 degree attachment to a 90 degree attachment, which was easily accomplished using a pair of pliers. During the remodeling time frame our town had its annual town yard sale, and we found an IKEA bed frame for sale for $40 which included a night stand. I had not planned on putting in a bed frame and head board, but for that price I couldn’t resist. 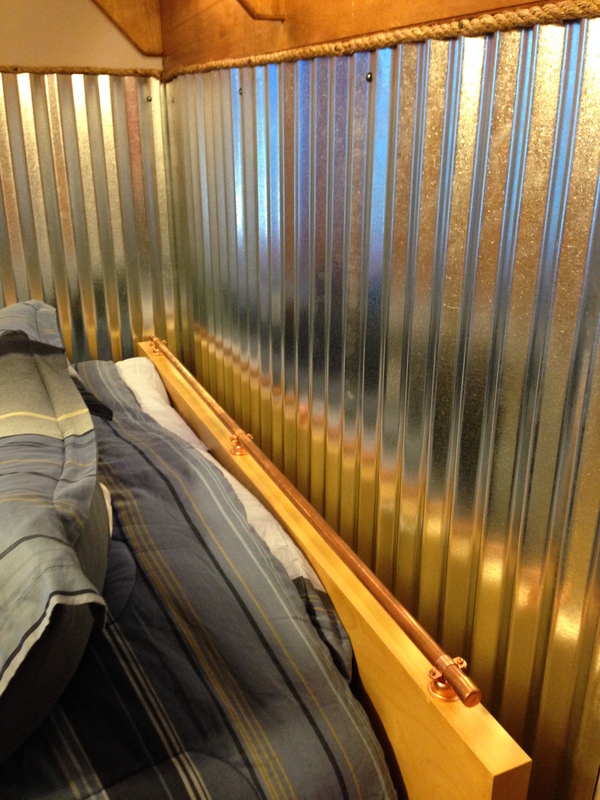 I wanted to convert it some to create an industrial feel so I used copper bell hangers to attach a 1/2 inch copper pipe to the top of the bed frame, and I loved the way that it turned out. I especially enjoy the reflection of the copper in the corrugated steel wainscoting which you can see in this picture. I wanted to add something industrial to the side table as well, and this time I opted for steel pipes. I was able to purchase all the pieces to add this “railing” to the side table without having to have anything cut to make it work. 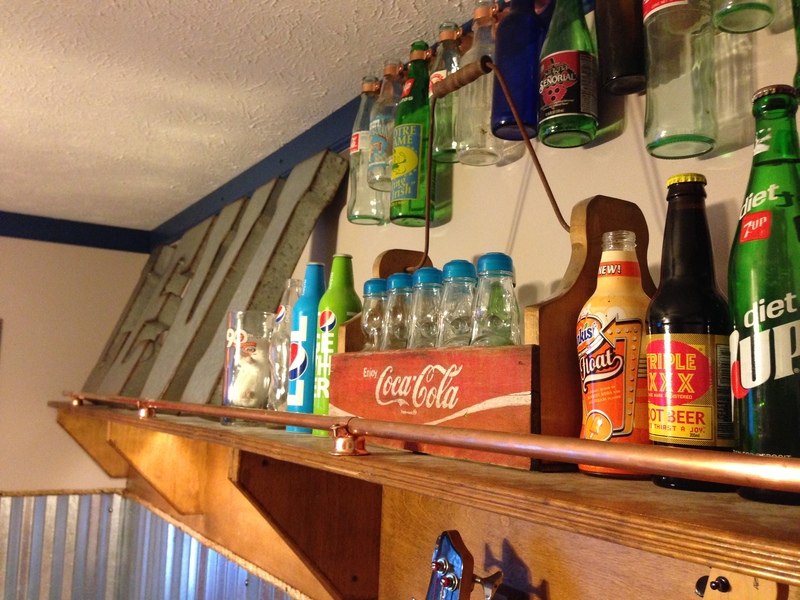 And speaking of industrial embellishments, I also added a copper pipe to the shelf, again using copper bell hangers to attach the copper pipe. This was really a last minute decision (I was at Lowe’s three times in one day because I kept thinking of ways to improve the room), but I felt that I needed to do it to keep bottles from falling of the edge of the shelf – which had happened a few times with raucous teenagers in the room. 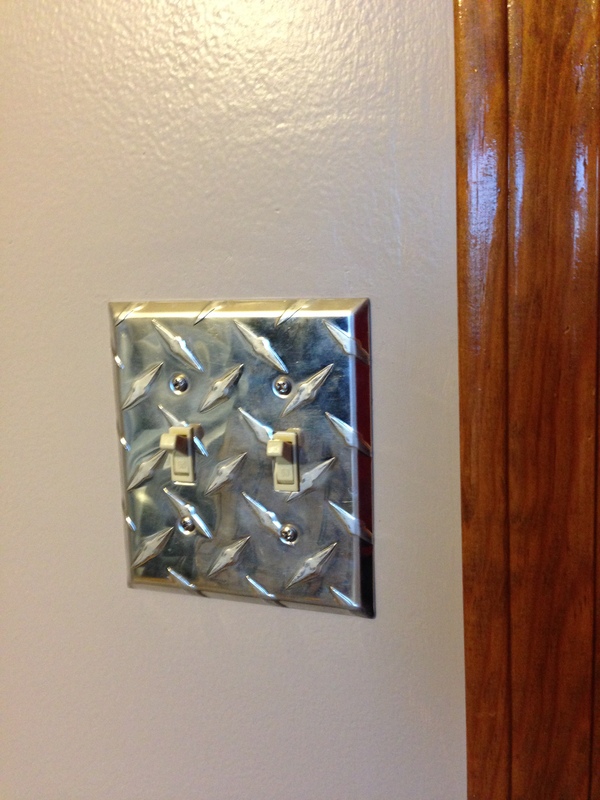 To add to the industrial feel of the room I changed out all the electrical face plates with these diamond plate ones. There are several places to purchase them on the internet and they are kind of pricey, but I was lucky enough to find a 14 piece set on Ebay which covered everything I needed except for the cable outlet – I think someone was remodeling a room and taking a bunch out – but I figured I save $100 by purchasing used ones and they look great! I find it funny how when you are working on a project you always manage to find things that will make it look better – and you have never noticed them before. 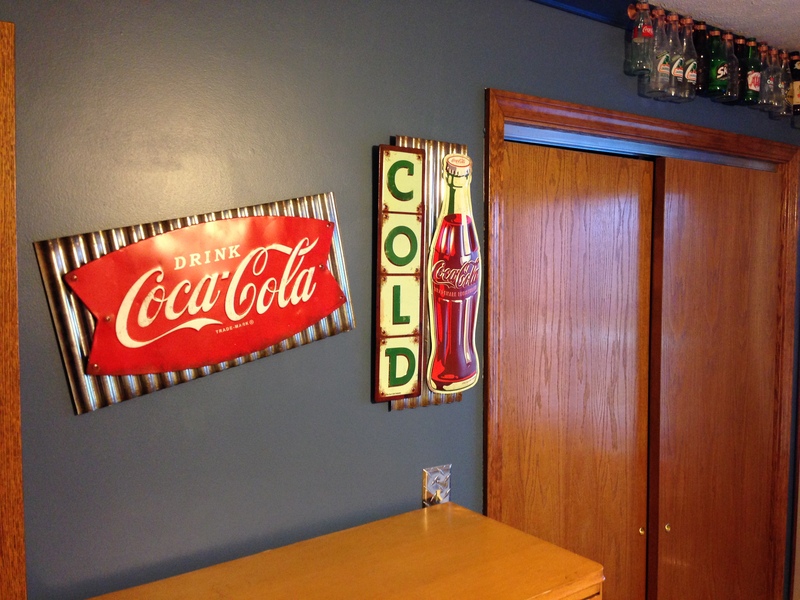 I found these two coke signs in the Hobby Lobby 80% of clearance aisle! 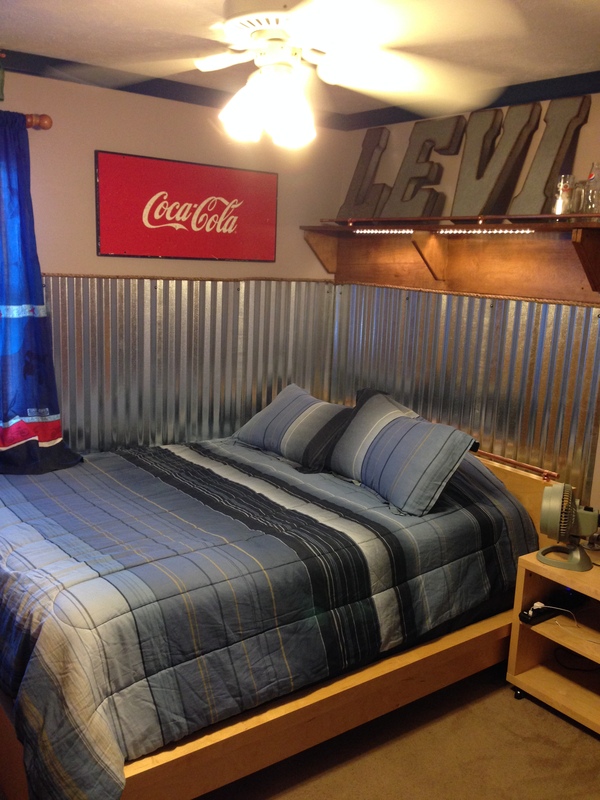 I loved them because they have both Coke and corrugated steel integrated into them – and it is as if they were made for this room! And the best part was that they were 80% off! Also, if you look at the top picture – you will see a large Coke sign. A good friend of mine knew I was working on this project, and texted me a picture of this when he was antique store shopping. I told him to pick it up for me right away when he told me that all they wanted was $20 for it – a solid metal Coke sign. While I was taking pictures of the room to share with you – our cat Joey decided that he wanted to be part of the show – so here he is! I like this picture because it shows really well two things that I like about the room: The first is the metal letters which spell my son’s name – purchased at Hobby Lobby, and the second is the under shelf LED lighting which I purchased at IKEA. It makes for a wonderful reading light over the bed and was very easy to install. Well, thank you for taking time to look all the way through my project. I will leave you with a panoramic view of most of the room. The weird shadows at the top of the border above the Coke sign are shadows from the moving ceiling fan, and not a terrible paint job on my behalf! 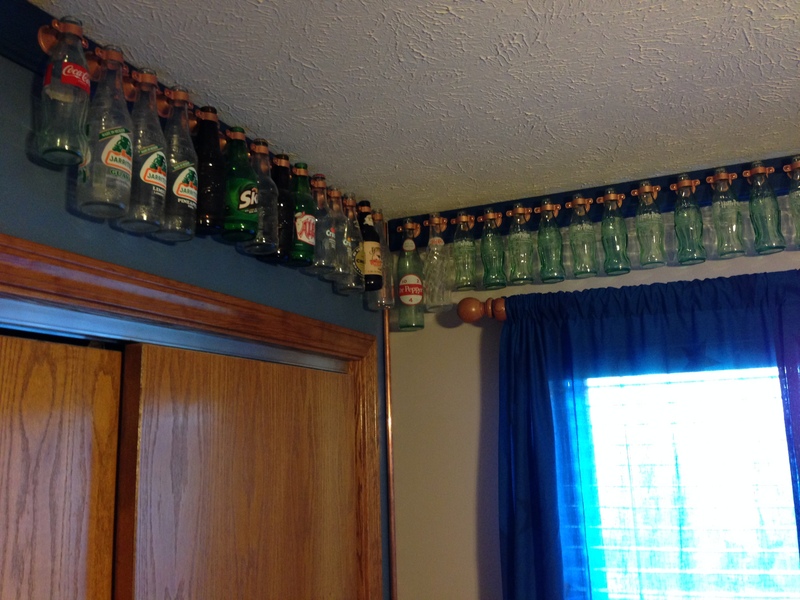 Love the way you hung all the bottles! 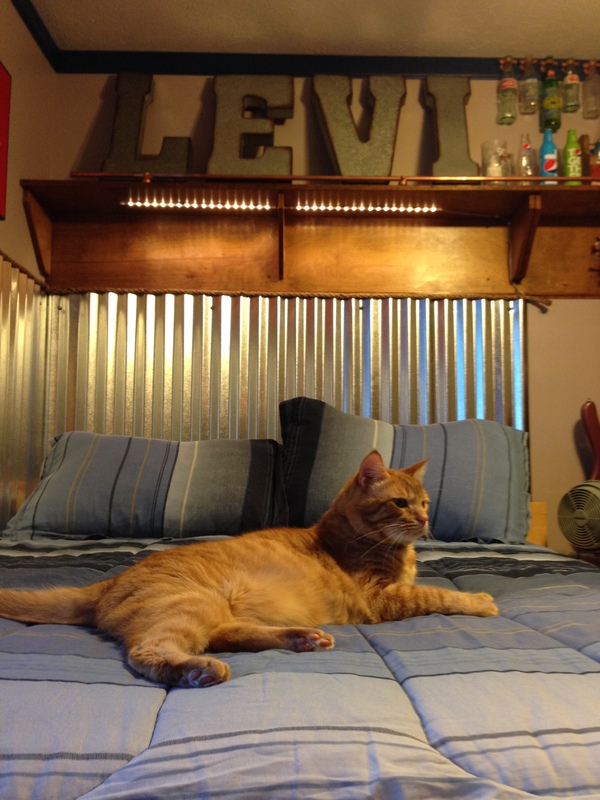 I am sure Levi loves his room and is a great mix of amazing industrial elements but still a room he can use!